Tell-tale scrape marks show linkage arm is scraping something. 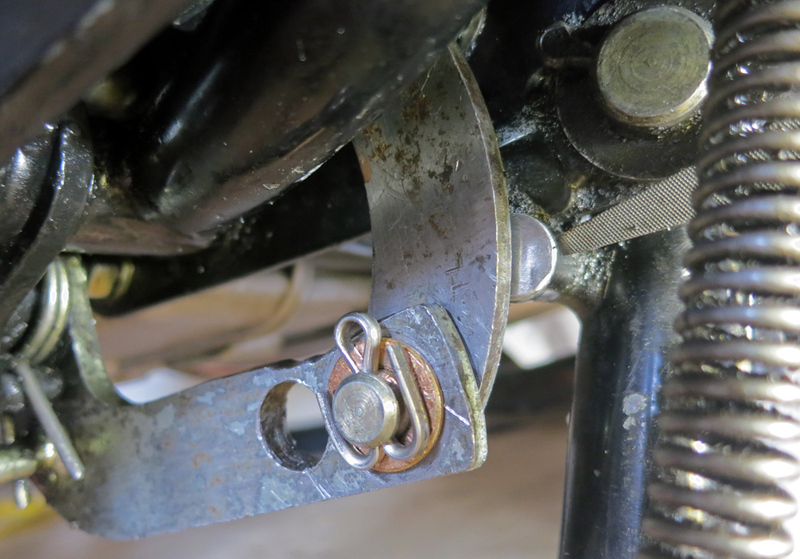 Weeks ago I confidently began fiddling with the left-shift gearbox linkage of my 1999 four-speed Royal Enfield Bullet, thinking that tightening it up would eliminate enough slop to improve shifting. 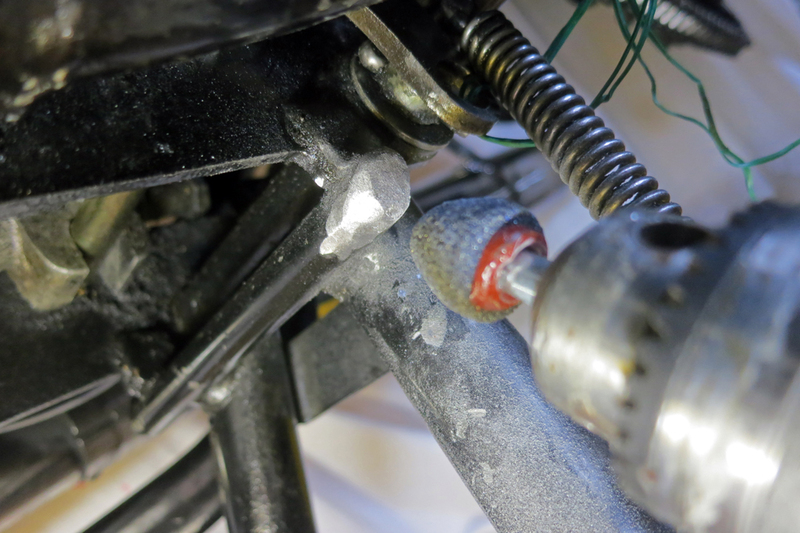 Eventually I began to suspect that my efforts to make the shifting "more direct" must be causing the linkage to foul protrusions along its nearly invisible path behind the massive Bullet primary drive cases. Could it be that the very sloppiness I eliminated in the linkage had been a necessity, allowing the assembly to wobble around these unseen hazards? Incredibly, is the crudely made U.S. spec left-side shift linkage in fact so bad it's good? Could it be that the looseness in the linkage isn't a bug, but a feature? I began to dread the test ride after each "improvement" I made. Invariably, shifting action got worse, not better, even as the linkage became tighter. The proof, I knew, would be on the linkage itself, in scratches along its arms inflicted by contact with other parts of the Bullet. But this gave me hope, too: the linkage was working. It was only just scraping the other parts in its path. Perhaps just filing away a bit of metal would restore full clearance. A miss, even by a millimeter, would be as good as a mile, I thought. I was naive. It took a lot more than a little filing. With linkage removed it's clear that big fat nut scrapes the linkage arm. After once more fishing the linkage assembly out from behind the primary drive cases I pulled out my magnifying glass. I saw scrapes on the inside of the center linkage arm that could only have been caused by the big nut on the lower gearbox stud. 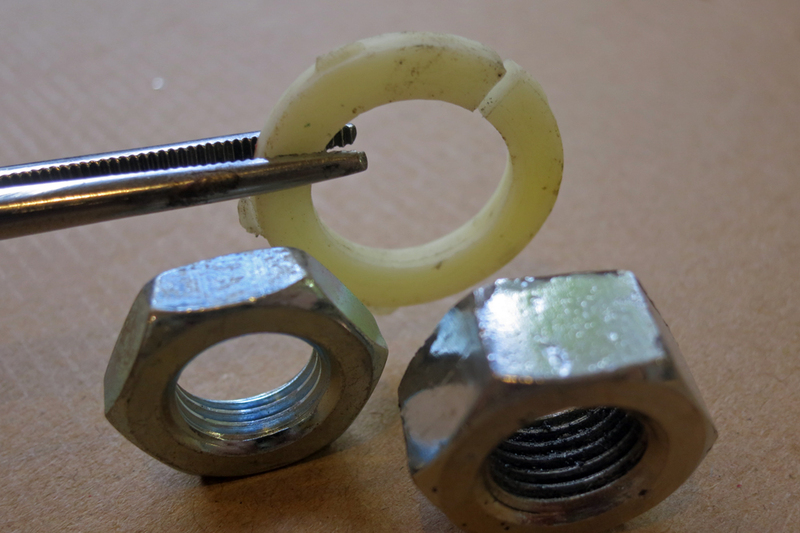 I removed the nut and replaced it with a thinner nut, but the end of the stud itself still protruded. There was no removing the stud without disassembling the motorcycle. But I was able to pull it farther to the right — away from the linkage on the left — by cutting a flexible washer and slipping it in on the right, under the head of the stud. Thinner nut replaces the fat nut. Flexible split washer slips under head of stud on right. I was now reasonably sure the linkage would clear the nut. 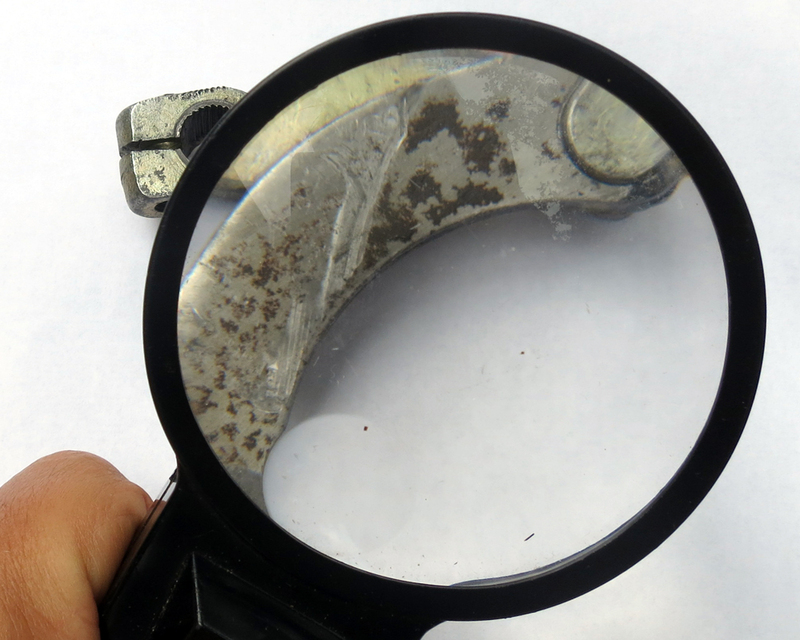 But, just to be certain, I filed away at the side of the center linkage arm itself, polishing away the scrape marks. I didn't remove much metal, but hopefully that little bit would also add to clearance. No doubt it did. But I was now in for a surprise. Linkage replaced. Arm pivot pin now scrapes nub of metal on center stand. 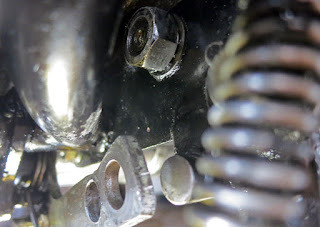 With the linkage free to swing more to the right the lower pivot pin that holds it together now violently collided with a protruding bit of the center stand. It was apparent that the more I worked to eliminate one interference, the more the linkage was freed to foul the other! Grinding away part of protruding nub on center stand. The interference was so bad that I had to purchase a grinding wheel to reduce the nub on the center stand. I fiddled and tuned the linkage for the first two years I owned my 2000 Bullet, until I gave up and did the right side conversion. Best mod I ever did. Not only do you get smooth consistent shifting, the neutral lever can be used as intended. I agree totally. Either convert to the right side which is where it is supposed to be, or part the bike out and buy something else. MacGyverring motorcycles CAN get you killed or at least make things needlessly problematic. A sobering warning. I began this process thinking that I was only putting the linkage into the condition it should have to work correctly. But, as you see, I've encountered concerns along the way that make me question my plan. A right-shift conversion may be in my future. Convert to the right foot shifter, take pictures, will make a great article and be great fun to boot!